Pursuing further education is not cheap and some of us may have obtained a tuition fee loan to finance our studies. Upon graduation, we will have to repay that loan - plus interest. So how do we handle that debt? Repaying your loan in full at once saves you the most money as no interest is incurred. If you are not able to repay the loan in full, you can choose to repay partially. But the amount cannot be less than $500 at a time. Alternatively, you can set up a basic monthly instalment plan to repay your loan with a minimum amount of $100 a month. You can take up to 20 years to repay the loan but, remember, interest accumulates. - Do not put off your repayment. - If you do not begin repayments in two years, you will be charged an additional 1 per cent late fee. - Plan ahead. Decide how many years you want to take to repay your loan and set aside an appropriate amount every month for repayment. 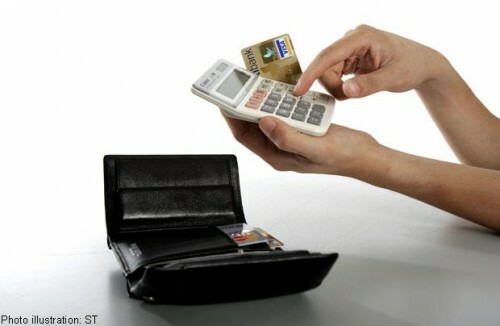 Credit cards are a form of borrowing that allows you to use money in advance. Any amount charged to your credit card is essentially how much you owe the issuing bank and any debt that is not paid within the stipulated grace period will incur interest. If you are unable to pay off the debt within the grace period, payment of a minimum sum will suffice, but the outstanding balance will be subject to prevailing interest rates - and will continue to roll over if you do not pay it in full by the next payment date. The current rate imposed on outstanding credit card debt is 24 per cent a year. - Spend within your means. Make sure that you are able to pay your credit card bills in full by every payment date to avoid interest charges and late-payment fees. - Pay cash. Do not make purchases with credit cards unless you have to. Making a habit of paying by card only makes it easier for you to lose track of your expenses. - It is not your money. Remember that your credit limit is not how much you can afford, but how much you can potentially owe the bank. If possible, consider getting a debit card instead. You can use your CPF to pay for your house, be it an HDB flat or private property. Your Ordinary Account can be used to make the initial 10 per cent down payment, the balance of the purchase price and also monthly instalment repayments of a bank loan. Note that you are eligible to buy a new HDB flat only if you and your partner have a combined monthly salary of less than $10,000. If you are buying a house with a bank loan, only 30 per cent of your monthly salary can be used to finance the home loan each month. You can also get a housing loan from HDB, but it will grant it only upon your using up funds in your CPF Ordinary Account towards the payment of your HDB flat. - Clear your debts. Your income level and existing debt play an important role in determining how much a bank can loan you. So clear your debts before applying for a bank loan in order to gain a higher loan approval. - Have an emergency fund. You should have an immediately accessible pool of money (up to six months of your income) set aside as an emergency fund. As home loans in Singapore do not have fixed interest rates, fluctuations can quickly add thousands of dollars in repayments. - Do not take out a second loan. Make sure you can afford the down payment of your new home. Do not take out a personal loan to pay for it. Ready for the next major milestone with your partner but not sure where to start? A wedding can be expensive, but you should not have to break the bank for it. It is important to know what you are in for before jumping into it. Knowing how much you and your partner want to spend is very important. Have a plan and budget for your wedding, and spend within your means - you do not want to overspend and bury yourself in debt. Classic wedding gown, silver wedding bands, 20-table lunch reception. Sweetheart wedding gown, gold wedding bands, 30-table dinner banquet. Princess-cut wedding gown, wedding bands with embossed diamonds, 60-table gala dinner at six-star hotel. Information compiled by Nanyang Technological University final-year students Agnes Ho, Vinnie Quek, Chan Long Teng and Shawn Choy.